Desmond King and Rogers Smith, writing in The New York Times of our current bipartisan silence on matters of racial equality, argue that the economic calamity of the United States is also a racial crisis. They say that it is not only justifiable, but also necessary, to evaluate policy choices partly on the basis of whether they are likely to reduce or increase racial inequalities. King and Smith note the findings of the Pew Research Center that in 2009, the U.S. median household net worth was $5,677 for blacks, $6,325 for Hispanics and $113,149 for whites. In the same way, in July of this year the unemployment rate was 8.2 percent for whites, yet 16.8 percent for blacks. African Americans and those of Hispanic descent started far behind and they continue to trail. Democrats now rarely broach the subject of race, leaving “modern Republicans with little to criticize, lest they appear to be race-baiting, so they too keep quiet.” King and Smith contend that political leaders must openly recognize that neither ignoring race nor concentrating on it exclusively will bring progress. This almost conspiratorial silence reminds me that there was a time when race was at the core of the U.S. national conversation. No citizen could ignore it. The nonviolent activism of the civil rights movement had roused the entire nation. The opponents of racial equality were not silent either—they dismissed civil rights workers as “outside agitators.” By their calculation, I was an outside agitator too, even though my father’s family had emigrated from England to colonial Virginia in the 1600s. 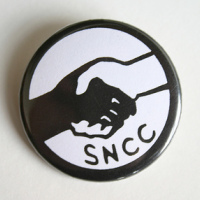 I was among the few Caucasians who went to work for the Student Nonviolent Coordinating Committee (SNCC) in 1962, starting as a volunteer, and becoming a member of the staff in 1963. It may surprise some, but any white person working for SNCC, as Stokely Carmichael put it, “experienced the full force of racist hostility from Southern white politicians, police, and public opinion. … At moments of confrontation they were at as great a risk as any of us, and as ‘race traitors’ were sometimes in even greater jeopardy.” The column in the Times reawakened that moment when whites and blacks worked together in a mass movement, indignant and no longer accepting the cruel and sometimes barbaric practices of racial discrimination. First and foremost, we shattered the silence. The risks were great, sometimes involving life or death. In a certain section of the black community in Danville, Virginia, police cars never followed the vehicles of civil rights workers. A particular street led across a deep ravine, an unpaved road beside the Dan River. The only route into or out of this neighborhood of the black community was along this high, treacherous, single road. When the police followed movement cars, as soon as they realized that we were heading for that particular lane, their cars would turn off and disappear. (I discuss this in more detail in my 1987 book Freedom Song: A Personal Story of the 1960s Civil Rights Movement.) Within this section of the black part of town, everyone knew the SNCC workers on sight, white or black, and recognized the donated cars we drove. Civil rights workers from outside Danville stayed with black families who took us into their homes, sometimes showing courage merely by doing so, feeding us from their own slender resources. All of us, black or white, were protected within welcoming black communities that nestled us under their protection. One of my first tasks after being sent to Danville was to find my way through the city to this single road that led to safety. I learned every route to that escape. Similarly, in Mississippi in 1964, I had 10 different routes to drive from our main office in Jackson to where I lived in Tougaloo, less than 10 miles away, in case I was under surveillance from the vigilante groups that operated with impunity. Mississippi silently condoned state terrorism. Having as much to fear from a police officer as from a vigilante, I worked out what I regarded as secret passageways into sections of the black community. Once I reached sleepy Tougaloo, a hamlet that had grown up around a college established for freed slaves in the 19th century, I knew that the black community would protect me to the fullest extent possible. The means available for shielding us were very limited, but we were enveloped and concealed within a caring community. The local people called us Freedom Riders, whether or not we had participated on the 1961 Freedom Rides, and everybody knew us. Most U.S. citizens no longer experience the fear that suffused the Deep South as a byproduct of its state-enforced racial policies. On the other hand, it has become easy to develop collective amnesia about a moment when quietude would have left unabashed institutional racism intact. The Republicans had been at the forefront as the champions of racial reform in the 1860s, but the two parties have now switched their roles. The contemporary repositioning began with Barry Goldwater becoming the nominee of the Republican party in 1964, and for the Democrats started with the passage of the Civil Rights Act and Voting Rights Acts in 1964 and 1965. King and Smith write in the Times that nowadays both parties virtually agree not to speak about race—a conspiracy of silence that has become an impediment to the genuine racial equality deserved by the whole nation. This silence is based in part on hope and in part on pretense that an historic situation confounded by profound ethical dilemmas has been corrected. Those who advocate “colorblind” laws, and eliminating racially-conscious measures such as affirmative action—which were never meant to be permanent—forget that our society still needs such positive programs to reform centuries of discrimination. Both political parties should join together and agree to confront the continuing racial quandaries until resolved. The country has much to be proud of, considering what the civil rights movement and ongoing exertions of countless individuals have achieved. Such successes redound to the entire people of the United States and are admired across the world. Yet it is, as King and Smith suggest, appropriate and essential to evaluate policy options partially on the basis of whether they may reduce or increase racial inequities. They offer several examples of fitting approaches. For example, measures that are not openly targeted on race yet are selected partially because they will benefit nonwhites can become the basis for policy debates. Employment tests can be adopted that are evenhanded and inclusive, enabling employers to more accurately gauge a job-seeker’s potential. Both parties should energetically take on the debate over policies like these that could narrow the racial divide. For many years, in studying civil resistance across the world, I have observed that the tools of public policy—charts, maps, policy papers, and statistics—are earning their way into the repertoire of methods of nonviolent action. This is no time for adopting a head-in-the-sand position. We must once more shatter the silence, and speak out about the data that show how the entire nation will benefit from racial equity.